In light of the scourge of sexual abuse perpetrated by ecclesiastics to the great harm of minors, I wanted to consult you, Patriarchs, Cardinals, Archbishops, Bishops, and Religious Superiors and Leaders, so that together we might listen to the Holy Spirit and, in docility to his guidance, hear the cry of the little ones who plead for justice. 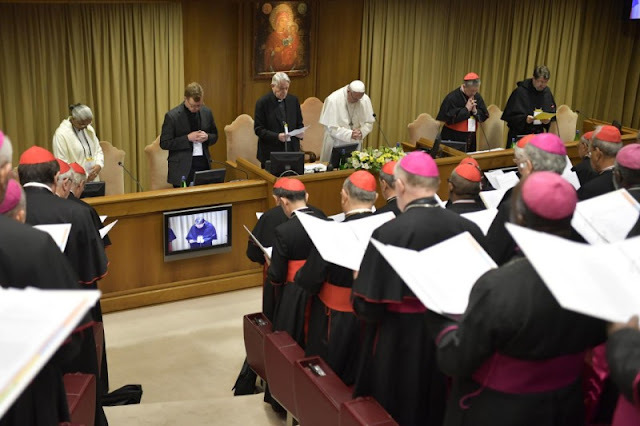 In this meeting, we sense the weight of the pastoral and ecclesial responsibility that obliges us to discuss together, in a synodal, frank and in-depth manner, how to confront this evil afflicting the Church and humanity. The holy People of God looks to us, and expects from us not simple and predictable condemnations, but concrete and effective measures to be undertaken. We need to be concrete. So we begin this process armed with faith and a spirit of great parrhesia, courage and concreteness. In your name, I would also like to thank the Pontifical Commission for the Protection of Minors, the Congregation for the Doctrine of the Faith and the members of the Organizing Committee for their outstanding and dedicated work in preparing for this meeting. Many thanks! Finally, I ask the Holy Spirit to sustain us throughout these days, and to help us to turn this evil into an opportunity for awareness and purification. May the Virgin Mary enlighten us as we seek to heal the grave wounds that the scandal of paedophilia has caused, both in the little ones and in believers. Thank you.